The western fox snake is a large snake with big, dark blotches. It is found mainly along the St. Croix, Mississippi, and Minnesota rivers. The western fox snake doesn't look anything like a fox. It got its name because when it is handled it gives off a musky odor similar to that of a red fox. This long snake has large, dark splotches on most of its body and dark rings on its tail. In young western fox snakes, the head has a black line from the eye to the jaw, and another across the top between the eyes. Western fox snakes do not have rattles. At 35 to 56 inches from head to tail tip, the western fox snake is among Minnesota's longest. The background color of the western fox snake is yellow to dark brown. The markings are brown or black. The western fox snake's belly is yellow with black marks. Adults have an unmarked bronze colored head. Although it lacks rattles, the western fox snake can make a rattly sound when it shakes its tail. 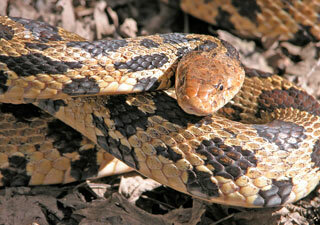 It also may hiss when threatened.Western fox snakes mate in the spring. The female lays 10 to 20 eggs in mid to late summer. The young hatch in late summer to fall. Newly hatched western fox snakes are 8 to 12 inches long. Western fox snakes live in forest edge habitats. They are often found along forested edges of our larger rivers. The western fox snake does not have special status in Minnesota, which means its population is likely doing fine.